In a future world, Thomas, a sixteen year old boy, wakes up to find himself in the Glade. Surrounded by boys everywhere, the Glade is a whole other world with its own sun. The only possible way of leaving is finding your way through a massive maze. This maze has eight unique sections and the walls of the maze move every night. Is also has robot-like animals called grievers that’s sting can lead to many afflictions which they cause “the changing.” The Gladers, people who live in the Glade, have adapted to survival and have created many different jobs such as the runners, people in charge of running through their section of the maze and drawing it. The runner compares their drawing with ones of before in their section to find the pattern. One night, two of the Gladers are coming out of the maze and Thomas rushes to help aid. The walls close and Thomas is stuck along with others. He manages to stay overnight, something that has never been done, which earns him the spot as a runner. Every month supplies and a new boy comes in a box from the Creators, the people who made the Glade, but it all changed after Thomas. A box came up with a girl holding a sign that said “She’s the last one. Ever.” Everything changed throughout the story and Thomas soon finds out how the Glade really works. 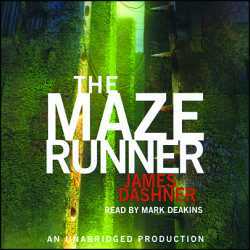 The Maze Runner by James Dashner was a very engrossing book. James Dashner did a wonderful job of starting very broad and getting more descriptive as the story goes on. Thomas’s perspective of everything, helped the reader relate to the book well, which helped engage the reader. The setting was described with much imagery which helped put a picture in my head. I think this helps the reader imagine the Glade as a whole other world. Despite all of these, the plot was somewhat the same as many books these days. It was unique in a way, but most of it was similar to other books. The ending was not the best. It was sad, but the way the escaped the Glade was not as fascinating as expected. This book has pretty easy vocabulary with a couple of eighth-grade level vocabulary words. I would recommend this book for twelve to fifteen year olds. All in all, I would give this book a nine out of ten stars. 1. What are some words that are part of the “Gladers” language? 2. Who is Thomas’s first friend in the story? 3. What is different about the greenie after Thomas? 4. How many sections does Glade have and what are they? 5. What did Ben do to Thomas and why? 6. How did Thomas save Alby? 7. What did the Keepers decide on what to do with Thomas at the meeting? 8. What did Alby see about Thomas during the changing? 9. How many sections were there in the maze? 10. What is the girls name? and how do we find that out? 11. What is special about Thomas and Theresa? 12. Why did Thomas was stung by a griever? 13. How did they find a pattern in the maze? What was it? 14. How did the gladers get out of the maze? 15.Why were the they chosen as grievers and what are they?